Burlap Concrete Revetment - Rip Rap (NR 83994) is a high strength 4000 PSI blend of sand and cement, packaged in heavy duty natural jute (burlap) bags. These burlap bags can be used to install running-bond retaining walls, and/or erosion control around culverts and ditches. Completed Rip Rap walls allow for substrate movement without damage to the structural integrity of the wall. There are no chemical prints on the bags. The burlaps require no punching holes in the bags for reinforcement. The bags will conform to the substrate base area and are harmless to wildlife. Once hardened, the environmentally friendly biodegradable jute (burlap) bags give the appearance of natural stone. The SlingBag™ patented system is designed to efficiently and safety store, move and place the burlap bags 5 times faster and safer – every time! As the SlingBag™ is moved by crane and positioned to each general work area; the workers remove the individual burlap bags from the SlingBag™ and place them. This procedure saves time, labor, & money by eliminating the need to manually lift the burlaps more than once. 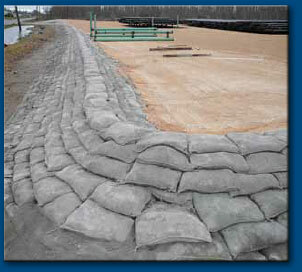 Erosion Control for shorelines, culverts and ditches.